Hiking pedometers can be a mixed blessing. The advantage of wearing a pedometer is that it tracks your mileage, breaking it down to number of steps taken. This information helps you correlate your position on your map, keeping you on track for arriving at your intended destination in a timely manner. You can set a step goal for number of steps you take each day to build endurance for an upcoming backpacking trip. Wearing a pedometer can mean anything from a tiny device which is virtually weightless and invisible, to something clunky on your wrist or arm that can interfere with your hiking stride or trekking poles. Out of the universe of hiking pedometers, how do you pick one? My suggestion: Start small and light, not burdened with over-the-top features you won't use. Unless you're in the market for a sophisticated fitness tracker that doubles as a pedometer on your weekend hikes, of course. Drop down to suggestions below for that kind of tracker. Let me share my experiences with a basic pedometer, and why I recommend this specific one to start your journey into the land of counting steps and calories. Note that I am not employed by this company, I just like their product. If you purchase your Jawbone gear through the links on this page, Hiking For Her receives a tiny fraction of your purchase price without increasing your payment in any way. 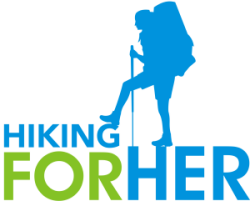 Thanks for supporting this women focused hiking website! I only recommend what I use myself, so you can count on my good opinion of the UP Jawbone hiking pedometer to be unsolicited and unbiased. They had to earn it, same as every other review on this website. I know for a fact that this little device will give you great service on, and off, the trail, if you're interested in lightweight and simple hiking pedometers. Specifically, the UP Move by Jawbone. See how small and simple it is? To jump right to the details, click on the image. Read on for why this little device acts as much more than a hiking pedometer. Not bad for such a small price point, right? You will need to download an app and use BlueTooth (to sync your UP with your phone) to view your data. But the process is easy, and believe me when I say that it's addictive to see how many steps you've taken at the end of the day. In fact, coming close to - but not meeting - my step goal often inspires me to go for a longer walk than I normally would have taken on the days when I'm not hiking. Or pushing on just a bit to see what's over the next hill during a hike! And after a hike, it's great to see how many miles you've covered and the number of calories burned. Use that data to feel justified in having a second cookie for dessert. If you're hiking for weight loss, the coaching feature of UP is priceless. and not have to pay extra for all of that coaching! Note that you will need to replace the battery every 6 months or so. And this device is not waterproof, so don't go floating down the creek with it. The tri-axis accelerometer won't pick up every small movement you make, so your step count is an approximation. But when I've compared my numbers to my phone fitness app, there's good agreement 9 times out of 10. When I hike, my phone is turned off, so wearing my UP allows me to track mileage. And if you'd prefer to wear UP on your wrist for better approximation of small movements, there's an inexpensive strap you can purchase. The UP pedometer is a bare bones approach to counting steps each day, or tracking your mileage on a hike. If you want to go deeper into the universe of fitness trackers, Jawbone is a good company to consider because of the wide range of options and price points. Figure out exactly what you want from a fitness tracker, how you'll use it on the hiking trail, and then choose the device that does all of that for you without interfering with your movements. Here's an example of what an upgrade can deliver. By stepping up (get it?) to the Jawbone Up 3, you pay more, but you get all of the features I've already noted, and a lot more. The cost is approximately 3 times the Jawbone Up. The battery lasts 7 days, and syncs wirelessly to both IOS and Android devices. You get two really interesting features to monitor your cardiac health as well as your sleep cycles. Hikers are classified as endurance athletes, because of the repetitive muscle contractions and variable heart rate associated with a hike. This Jawbone Up 3 device will track your heart rate throughout the day. You can use this data to determine if your conditioning hikes are strengthening the important cardiac muscle called your heart! It's also valuable insight into the top and bottom of your heart rate numbers. A low resting heart rate indicates good cardiac health. You can monitor for your target heart rate if you're working on cardiovascular fitness. Sleep is a vital component for a healthy hiking body. If you struggle with establishing a quality sleep pattern, the UP 3 offers advanced sleep tracking to automatically capture your sleep cycles: light, deep and REM (Rapid Eye Movement = dreaming). It also has an alarm you can set to wake you at the optimal point in your sleep cycle (the Smart Alarm). I hate it when a good dream gets interrupted, don't you? Not only is counting daily steps and calories addictive, you might find yourself in a competition with your trail buddies to meet (or exceed) your daily goals!